When petrol lawn mower parts break down, it is so important to understand the reason for the breakage, to prevent it from happening again. If you are having problems starting your petrol lawnmower, then it can be a frustrating time, but instead of worrying about the cost of a new machine, new replacement parts can fix the job quickly and easily. You can of course run through some basic checks yourself to make sure your mower starts straight away. Petrol degrades over time in your mower if has been left standing in the garage can cause it not to start, so the best thing is to drain the old fuel and then refill with fresh fuel you can add a fuel stabiliser to the new petrol which will keep it fresh for up to 18 months. Regular checks on your oil level also help to keep your petrol mower running smoothly. Spark plugs do have a limited life span, so regular care and maintenance should allow you to see when they may need to be replaced. There are times when what you absolutely have to do is purchase spare parts from a reputable, well established and trustworthy supplier. For instance, when your petrol mower engine is slugish or faulty you will not be getting the most out of your machine. Lawnflite Spares online can help you to give your mower a new lease of life with replacement Spare parts, which can help you to get your lawn looking just what the doctor ordered again in no time. With the exact information to hand usually, the every day maintenance jobs are fairly easy to carry out. For all you need to know to about ensuring that your petrol mower is kept working smoothly, from fitting a new blade to keep the engine pristine, Lawnflite Spares online is the only answer you need... So, if your petrol mower engine is running, however it is not driving you may need a replacement Drive Belt and that’s where our experts can step in. The spare parts that you need will of course depend exclusively on the model of your lawn mower, its age, and the precise lawn mower parts that you need. Having the model number of your petrol lawn mower makes it much easier to shop around our site for lawn mower parts online. A tip for finding the model number of your machine on top of the body there is usually a manufacturers sticker on this sticker you will find the model number of your machine, its the long number you are looking for beginning with 12 or 13 put the full model number into the model number search on Lawnflitespares.com and it will bring up all the drawings specifically for your machine then select the parts you need and place your order simple. Lawnflite Spares provides parts and components for all petrol mowers and can help you to work out any issues that you have in regards to selecting the correct spare part for you machine. Many lawn mower parts can look very similar so it is invaluable to get expert opinions on your purchase. 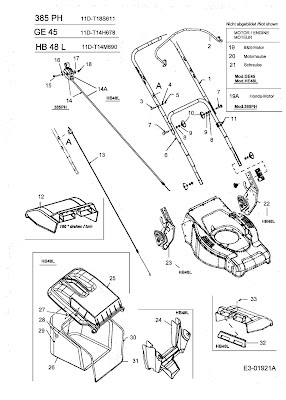 If you do need to fix your petrol mower, from the 050P to the 385 PH, then you can visit lawnflitespares.com who are an authorised UK supplier of spares, parts and components for all Lawnflite Machinery.